With the revival of handloom sarees as initiated by several Indian designers and the Fashion Design Council of India, more and more women, especially the youth has started investing in the handmade pieces of art. These sarees include Kancheepuram, Banarasi, Tussar, Ikkat, Patola, South Indian silks, Kalamkaris, Ajrak and more. These handloom sarees are either bought from the market or passed down from generation to generation... they are emotional investments and family heirlooms. The work done on these sarees are intricate and hand painted. This explains why handloom sarees require handling with a lot of attention and care. They are prone to environmental corrosion, staining. You can give them for dry cleaning but then we hope you trust them enough. But if you can't do so, then here are some tips that we can pass down to you. Wash them with soap but soak in salted water for a while but not overnight at any cost, it may lead to discolouration. Once you are done with the soaking, rinse it with cold water before washing with a detergent. Buy some good quality, mild detergents and please ditch bleach, harsh stain removers etc when it comes to using them on delicate fabrics. Do not use a brush, even for stains, as it can easily tear the fabric. Always use cold water. STAY AWAY from Washing Machines. If you have accidentally dropped oil on your saree, sprinkle talcum powder on it. After 2 minutes, rub it gently and wash it off with cold water. If you have dropped some beverage or curry on it, the dip some cotton in petrol and wipe it off. If the stains are tougher then please go to a dry cleaner. Never squeeze out the water to avoid permanent creases. Wrap your drape in tissues/towels and press it gently. 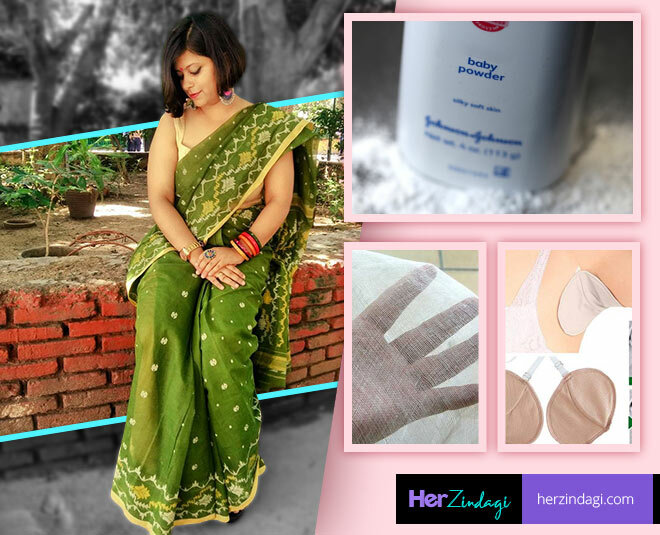 Spread the saree on flat surfaces, avoid painted surfaces or places with rust on them. Always maintain low heat while ironing the saree. Never spray water on it before ironing. Always keep the garment on an ironing board before pressing to avoid creases. Ensure your saree is dry before storage. Always keep the saree wrapped in a muslin cloth. Store the saree in a dark and dry place to avoid eventual fading of the fabric. Your sarees should always be stored in a vertical, hanging position in your cupboard and try to hang them on hangers which will not rust. Stay away from naphthalene balls, reach for neem leaves. Change the saree folds to avoid creases. Never apply perfumes, deodorants directly on your sarees. Do your makeup before wearing your saree to avoid stains. Sweat stains can be a major issue as it leaves stains, therefore wear sweat absorbing pads under your blouse. Get that loose embellishment or torn area fixed quickly. If you have more such tips, do share them with us on our Facebook Page.